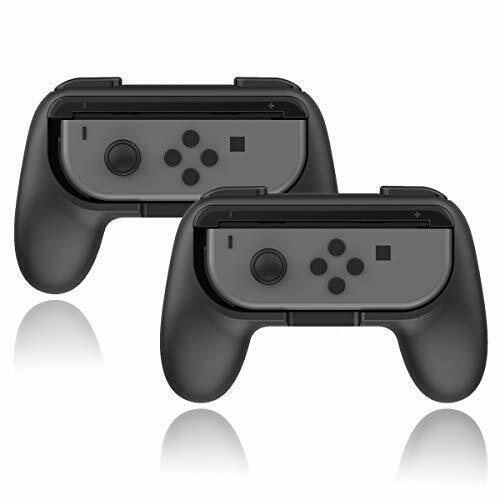 For Nintendo Switch -Nintendo Switch / Nintendo Switch Protection Device，it is not made by nintendo,and made by third party. 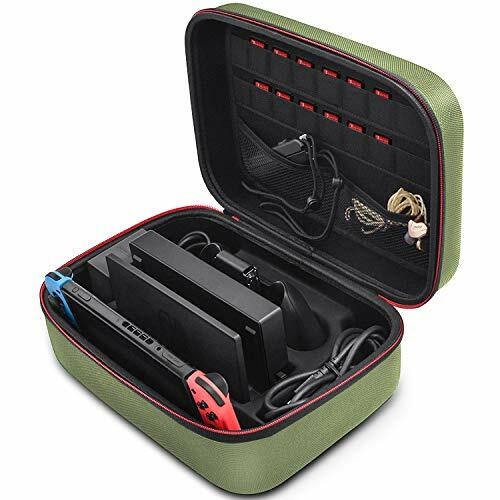 Large capacity storage-Our Switch Carry case is big inside but small outside.There are 20 built-in game card slots,allowing you to carry and change your favorite games anytime & anywhere mesh zipper pockets, small space for charging cords, headphones, small Charger,SD cards, JOY-CONS, etc. 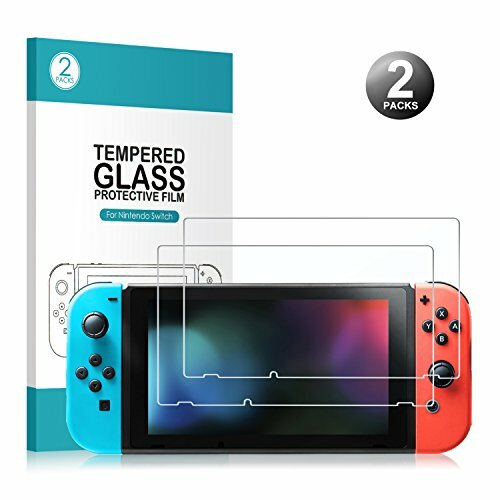 Film Tempered Glass Screen Protector - Highly durable and scratch resistant. 90-Day Money Back or Replace Guaranteed -Any query, please feel free to contact us at the first time.We will ALWAYS replace a faulty product or refund your purchase within 90 days. 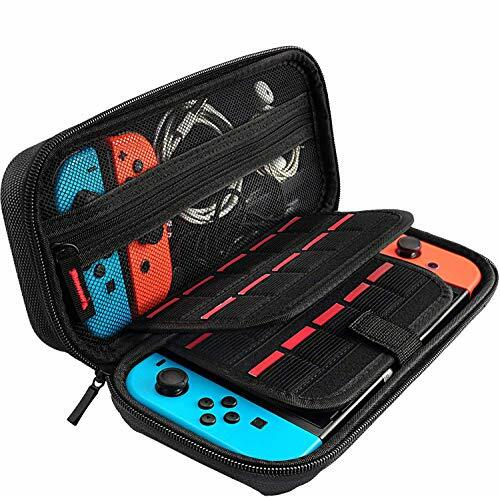 Unique Zipper Head Design - We use High Quality Nylon Zipper Head, not like the other Nintendo Switch case's Iron Zipper Head will scratch your precious switch. Zipper ensures your small items do not fall out. 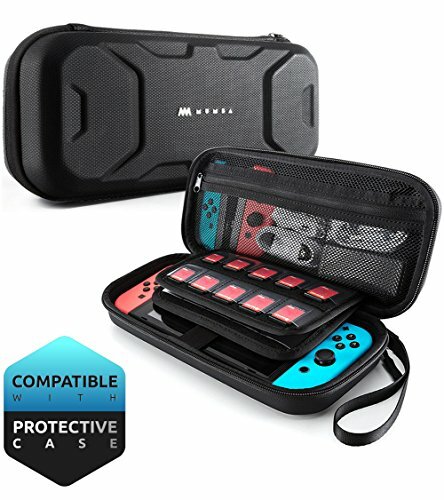 Multiple Protection - Our Switch Carry case is big inside but small outside. There is absolutely strong enough for plenty of daily protection. 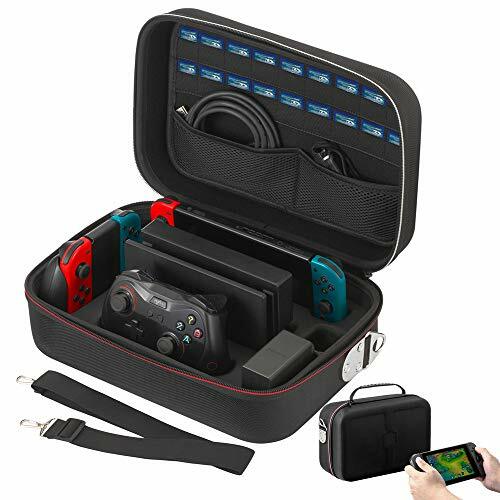 Designed to make your new Nintendo Switch Console even more portable & travel friendly. 100% Guarantee Service - We offer free replacement or full refund if you are not fully satisfied with our case, Hestia Goods adhere to the high-quality products and services for the purpose. 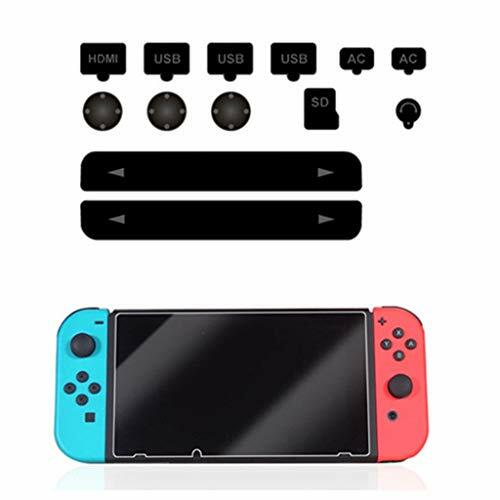 Easy installation: Left and right joycons can be freely removed without removing the switch from the case,no scratches, no wear, easy for you to play one machine and easy to play split games. Shock Absorption Switch Case Upgrade: With TPU drop-resistant material, no deformation, strong defense design, strong resistance to punching, provides shock absorption all around with added coverage along the edge and top notch. Scratch-resistant Transparent Polycarbonate back cover: Using high-quality PC materials, the transparent back panel has strong scratch resistance, strong thermal aging resistance. Beside the transparent back panel and black body protection cover appear to be higher end atmosphere and more stylish. Ergonomic safety handle: According to the user's two-hand holding habits,select the line design to make it more comfortable and just enjoy the gaming experience. 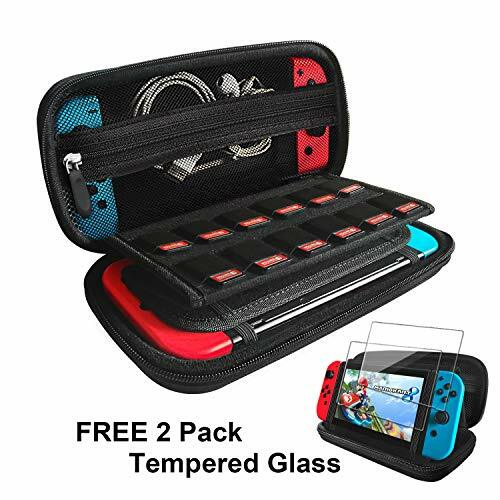 What you get: 1x Nintendo Switch Protective Case Cover,1x Tempered Glass,2x Cover Cap.Beside, you will get 1 Year Free Warranty/ replacement and 24- Hour Friendly Customer Service.Note:European Appearance Patent Certification,imitation is prohibited. 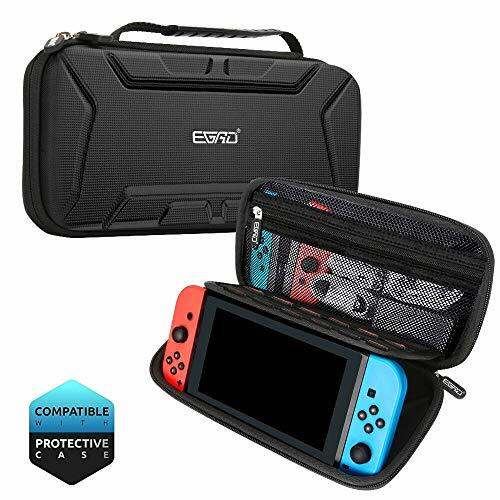 PORTABLE - Slim, sleek and compact, this case makes it easy to keep your switch safe inside your bag during travel. ▶[Newest Holder Design]: Equipped with an extra card slot board as a Nintendo Switch holder. It is more convenient and comfortable to play games. ▶[Dual Protection,Waterproof &Scratch-proof]: Shock and collision proof, prevents scratches and damage. High quality durable EVA hard shell and waterproof surface. 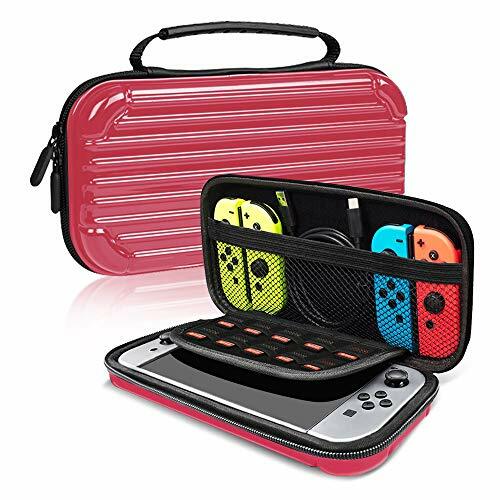 ▶[Easy to Carry]: Designed to makes Nintendo Switch more secure, portable and travel friendly with wrist strap, perfect carry case for keeping your Nintendo Switch securely stored when travelling or when not in use. 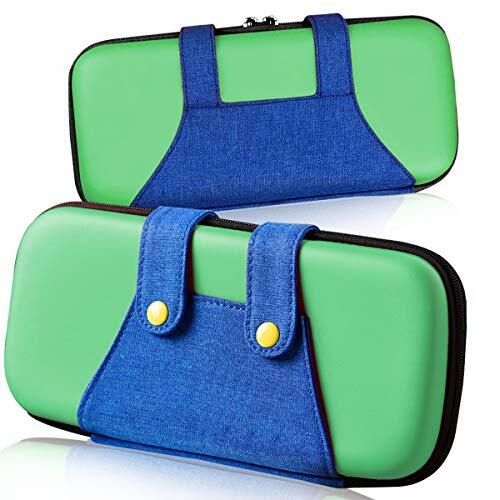 The handles are made of hard PC material, with leather texture. You may change the colors of the grip as you like. Each handle allows to store a game card into the grip, you can easily bring two game cards anytime. 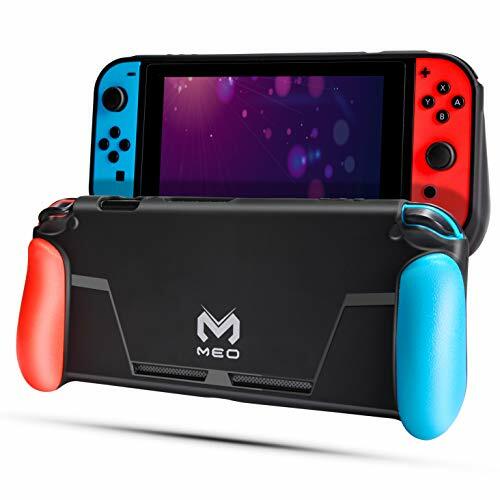 Meo Switch Case is made of soft TPU (thermoplastic polyurethane) material, similar to silicone as environmental friendly materials. 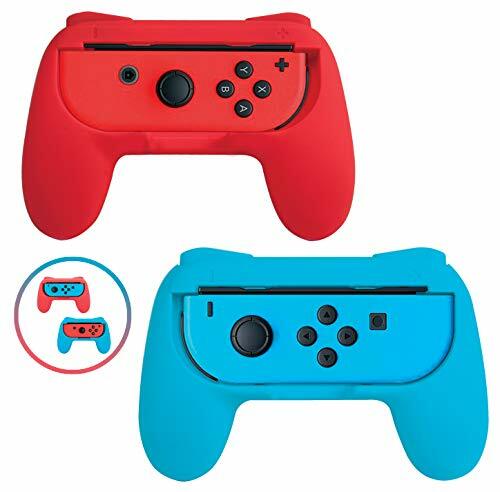 It will not scratch your switch like hard plastic. Most importantly, our Case is easy to put on and remove. Unique Zipper Head Design - We use High Quality Nylon Zipper Head, not like the other Nintendo Switch case's Iron Zipper Head will scratch your precious switch（We show this contrast in the 5th picture）. Zipper ensures your small items do not fall out. 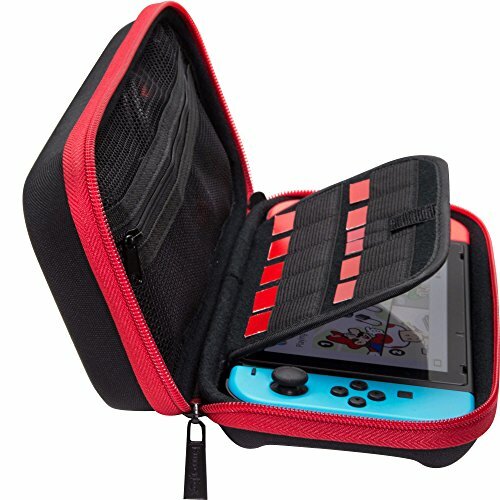 【Design For Nintendo Switch Size】- A slim, lightweight protective carrying case and storage holder protect your Nintendo Switch from accidental bumps, scratches, and drops while in case! 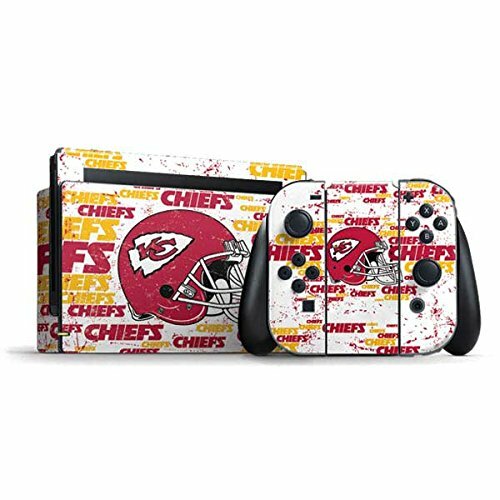 High Quality Durable hard shell Protect your Nintendo Switch Console free from scratches. 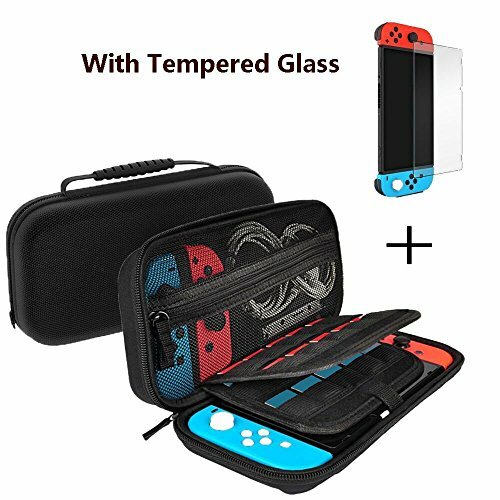 【Durable Hard Shell Case】- Sturdy carrying case for Nintendo Switch. 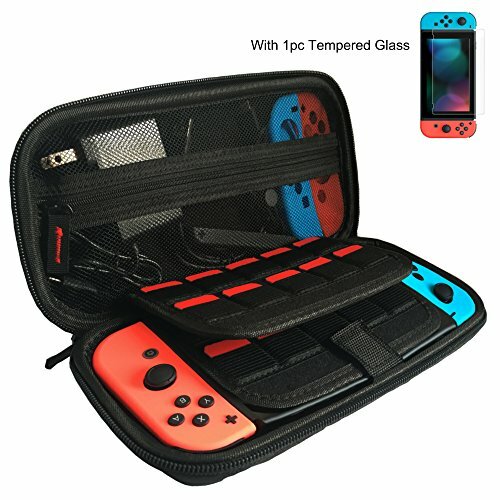 Protects Nintendo Switch from accidental bumps, scratches, and drops while in case. 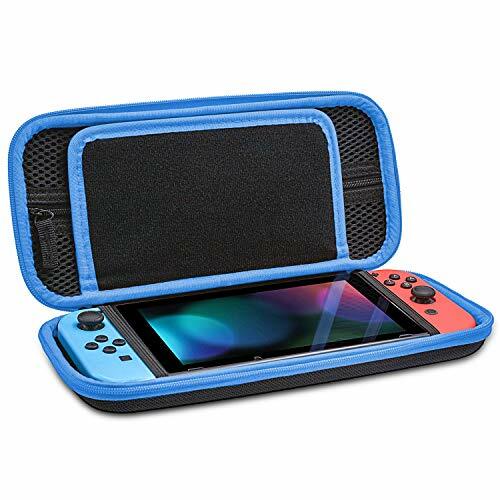 Soft inner material with a padded divider protects Nintendo Switch from scratches and wear. 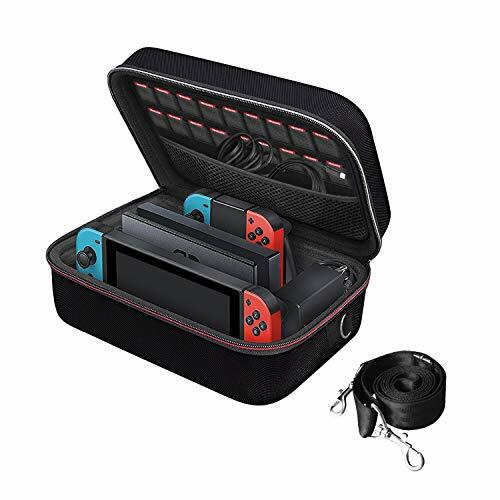 【Storage & Portable】- 10 bulit-in slots and one pocket allow you to take your favorite Nintendo Switch game cards and other accessories on the go. 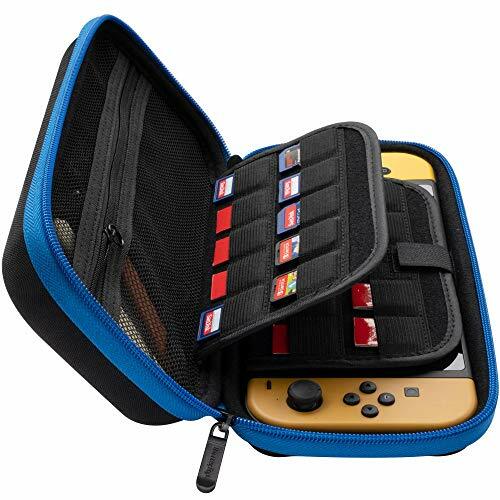 A zipped mesh pocket provide storage room for small Nintendo accessories like charging cable, ear buds, SD cards, and extra joy-cons. 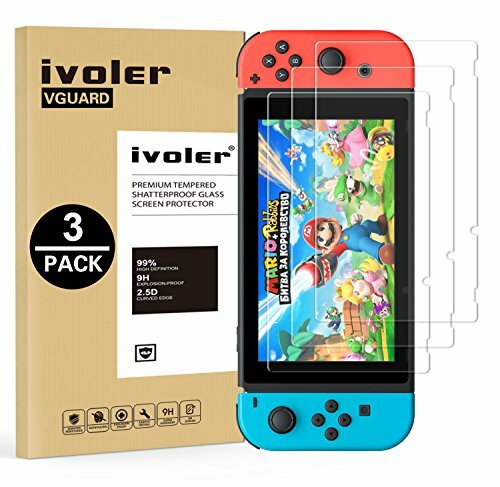 【Environment Friendly Sturdy Materils】- This protective casing for Nintendo Switch is constructed from environmental protection materials that are non-toxic and disburse no smell. 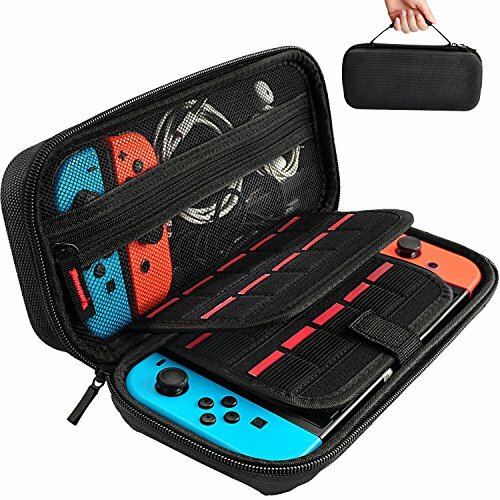 All-around zipper keeps your switch console and accessories secure, easy to clean. 【Tonaka Warranty】- 100% Money Back Guarantee & 12 Month Replacement Warranty ensures customer satisfaction. If you have any problems with the product, feel free to contact the seller directly. EXCELLENT PROTECTION: Made by the high quality Nintendo console cases manufacturer on Amazon our Nintendo Switch cases offer great protection to your Nintendo Switch. The outer hard shell protects machine from drops. Inner soft micro fibre lining gives your Switch a snug and comfortable home. A central soft flap protects the screen from being scratched inside the case. 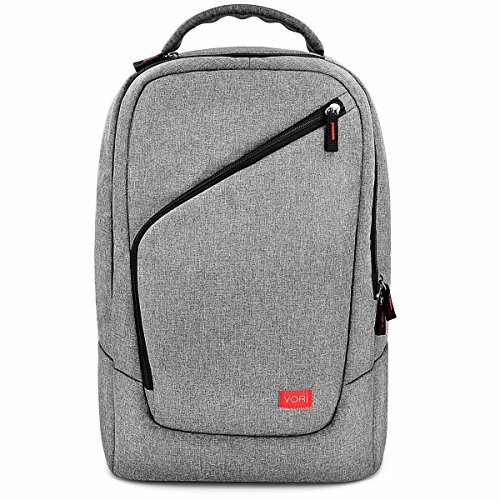 A Velcro strap secures the Switch from dropping out. LARGE STORAGE: Our case is big inside but small outside. It can be put in any messenger bag or a backpack. It features 9 built-in game card and 2 micro SD card storage holders. 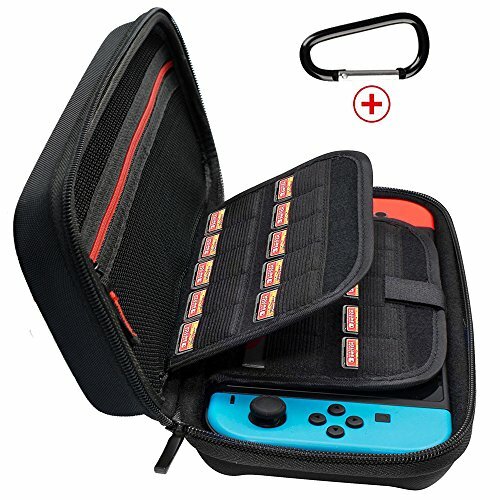 A zippered large mesh pocket provide storage room for the official Nintendo AC adapter and other small Nintendo switch accessories like slim power bank, ear buds, and charging cable. The image shows an AC adapter and two Joy-cons with straps. 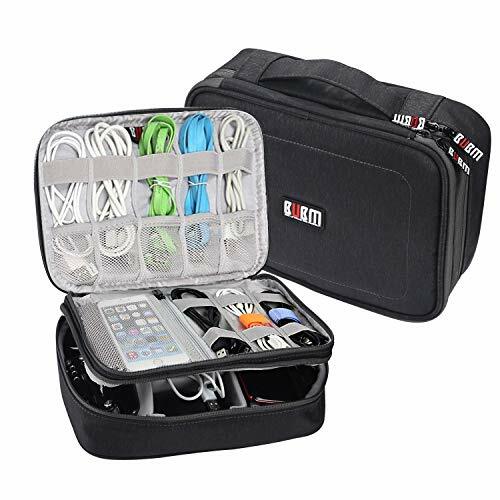 ★Make Life Easier, BUBM Electronics Travel organizer is designed to keeps your essential gadgets in order and in reach without searching all over the place, which is a must-have for daily life / school / office / business trip / holidays, etc. TOLERANCE: 1.Enlarged the case to make sure Joy-con buttons are not pressed down in any case; 2. Replaced two elastic straps with a Velcro; 3. Added a lifting tab for easy removing the Switch. 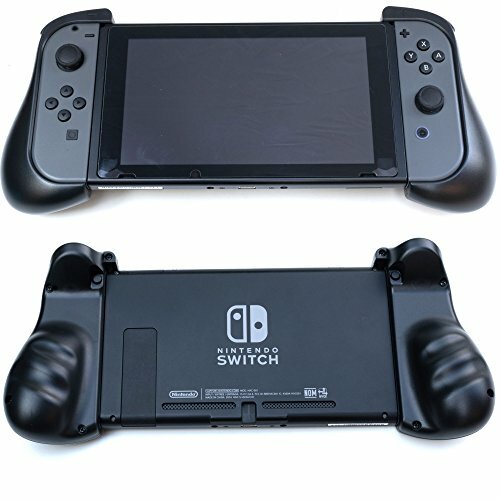 HARD and DURABL: Durable hard shell case protects Nintendo Switch from drops and scratches. EXCELLENT PROTECTION: The outer hard shell protects machine from drops. Two soft central dividers protects the screen from being scratched inside the case. They also stop the analog sticks from being pressed inside the case. GREAT PORTABILITY: Our case is big inside but small outside. 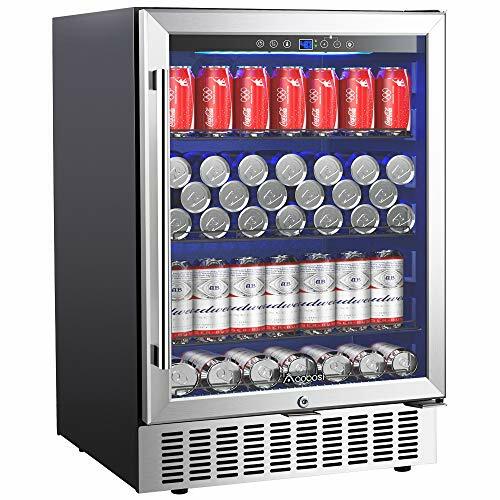 It can holds a lot but it is not bulky and is very portable. 100% MONEY BACK GUARANTEE:Our high quality Nintendo Switch case is backed with 100% money back guarantee. 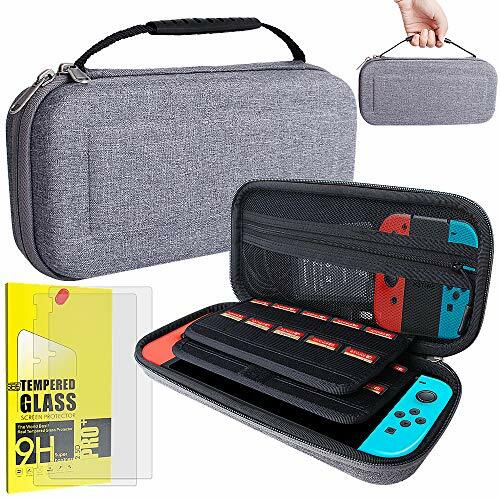 We offer free replacement or full refund if you are not fully satisfied with our Nintendo Switch case, no question asked! 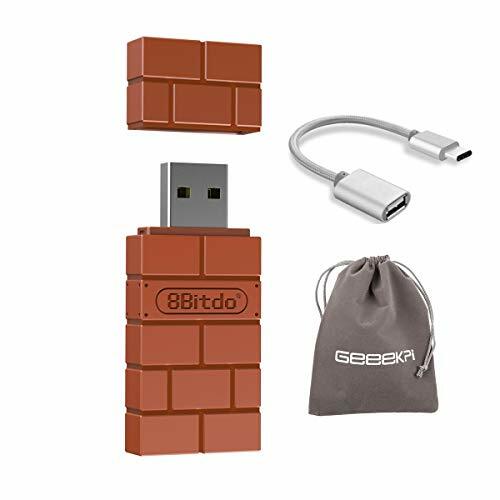 NOTE: The Switch and accessories are not included and are for illustrative purposes only. 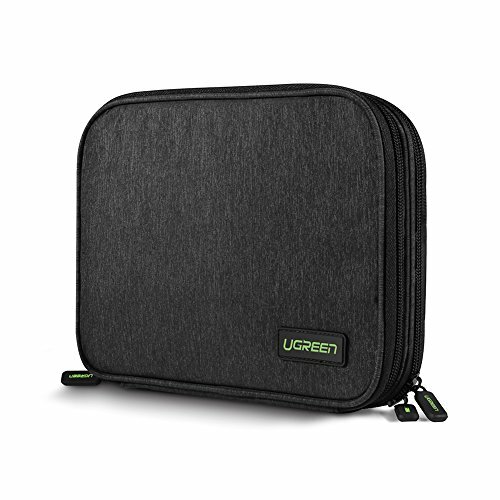 Electronics Travel Organizer: UGREEN electronics travel organizer is designed to keep your essential gadgets in order and in reach without searching all over the place, a must-have for daily life, school, office, business trip, holidays and more. 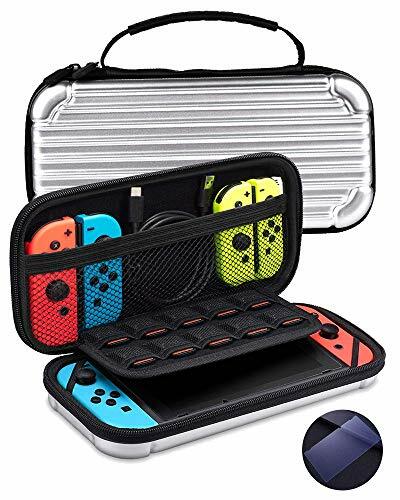 Double Layers for Great Capacity: This gadget organizer has double layers, including one large mesh pocket for the storage of a small tablet like iPad Mini, Nintendo Switch console with 2 joy-cons, E-book reader and other 7.9'' tablets. Small mesh pockets are designed for storing power bank, 3.5'' hard drive, mouse or smartphone, etc. Elastic loops in the bag are used for small items such as USB cables, earphones, flash drives and sd cards. 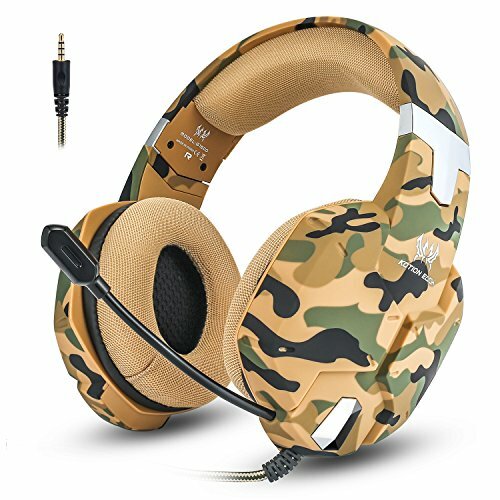 High-Quality Material: No peculiar smell, heavy duty and durable nylon exterior and soft lining interior offer great protection against scratches, dust, impacts and accidental dropping. 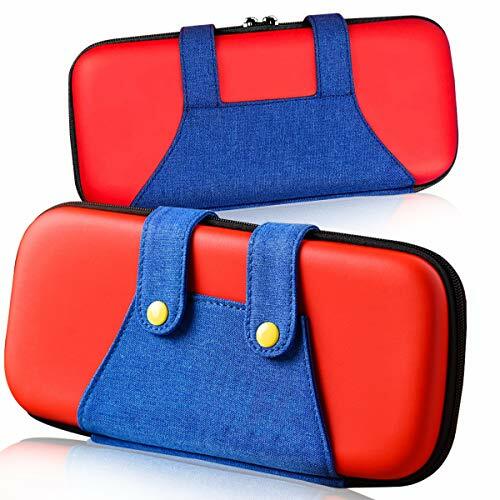 Compact and Portable: With the size of 9.6" x 6.9" x 2", this accessories case can be easily put into your backpack, shoulder bag, handbag, laptop bag or luggage. Easy to carry, it is a great partner for you at travel or in the office. Double Zipper Design: Convenient double zippers of the sleeve pouch provide quick access to all your organized gadgets, easy to open and close. 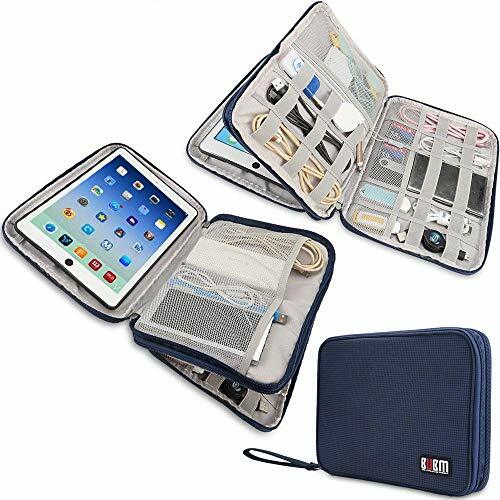 ■ Lots of Storage Space - The multiple layers design gives this electronics travel organizer bag more storage space.They will fit your iPad,power bank,phone charger,cable,laptop adapter and etc.It will keep them separated and easy to be found. ■ Durable Shockproof Waterproof - This electronics travel organizer bag is made of double layers waterproof fabric and shockproof material.All the items in this bag will be protected very well.The high-quality zippers are sturdy and durable. 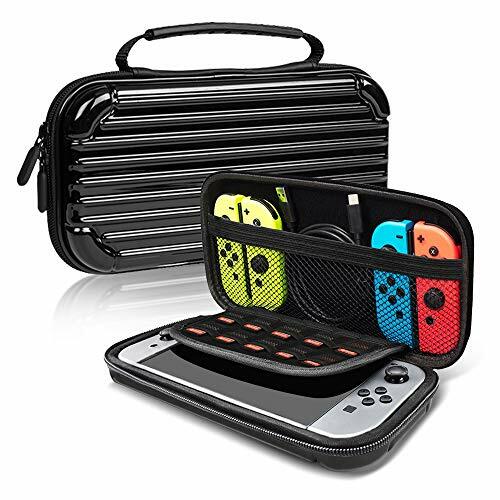 NEW RELEASE (May 18): the latest upgraded design of ButterFox carrying case for Nintendo Switch with improved zipper and better build-quality. As an original designer we have upgraded this case three times since March 2017. This is version 4 of our popular Switch case. GREAT PORTABILITY: Our case is big inside but small outside. It holds a lot while remaining compact. 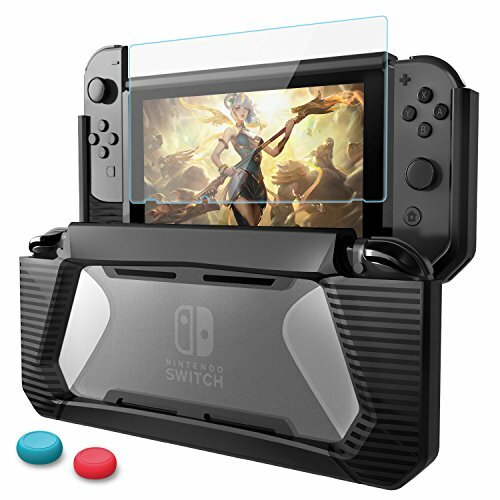 100% MONEY BACK GUARANTEE: Our high quality case for Nintendo Switch is backed with 100% money back guarantee. 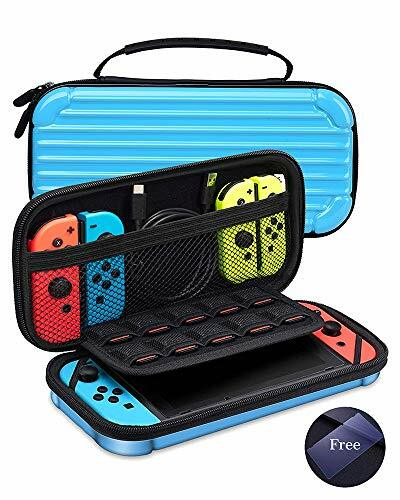 We offer free replacement or full refund if you are not fully satisfied with our Nintendo Switch case, no question asked! . ONE-TOUCH SWITCHING - One-touch display switching, freely switch between the host and the TV display interface. And uses HDMI 2.0A version output scheme to make the game screen clearer. 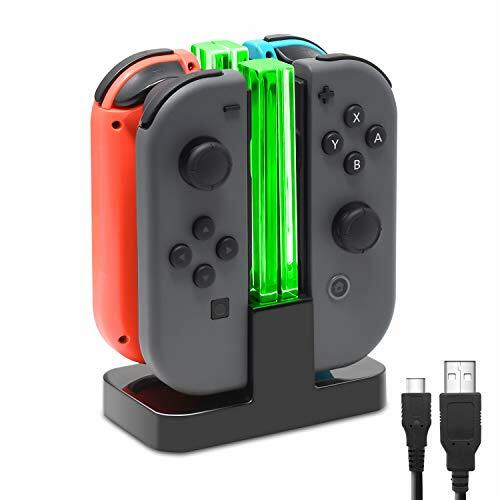 LIGHTWEIGHT & PORTABLE - Unlike the heavy and bulky original Nintendo switch dock, this dock is much smaller, easy to carry around and it works as good as the standard dock for Switch. Its small size fits well in pocket, Switch case and travel bag. 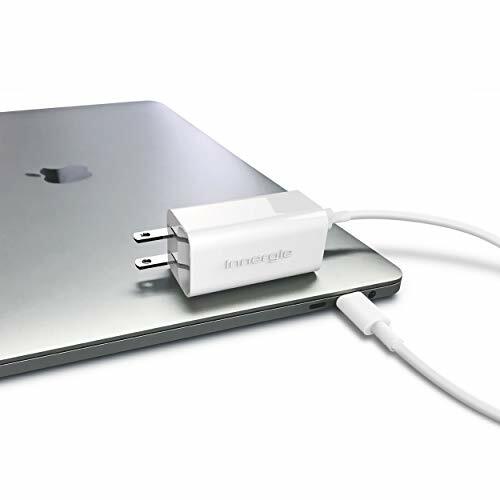 You can easily take it with you to office or friends' house without having to carry the whole dock. It's also a great alternative to original dock for traveling, so you can kill some time while playing switch games on hotel TV. CHARGE WHILE PLAYING, WITH NO OVERHEAT - You can play games on the Switch in table-top mode while charging. The console sits on top of the unit instead of sliding into the Switch docking station, so ventilation holes won't be blocked, and avoid overheat. It allows you to play with Switch for an extended amount of time in your favorite games. Perfect for game nights. There's also no risk of scratching the screen when undocking or docking. 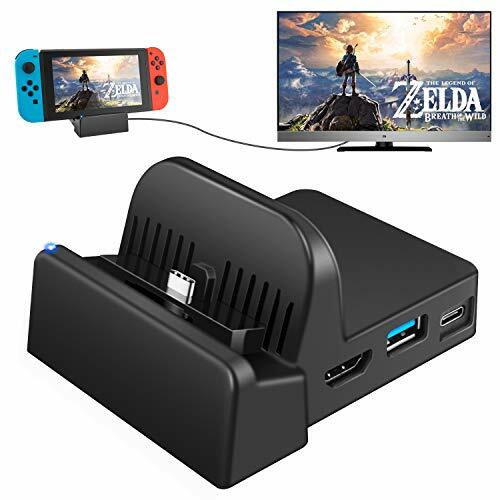 EASY TO USE SWITCH TV DOCK - After connected the dock adpater to TV/projector with HDMI cable and charger plugged in, Switch will be recognized by TV immediately. The audio/video quality is as good as the original dock adapter. You can switch between console dispaly and TV display in seconds, by just pressing the button on the dock. There's an LED in the button to show when it's under TV display mode. You can charge the switch at the same time while playing with TV display. 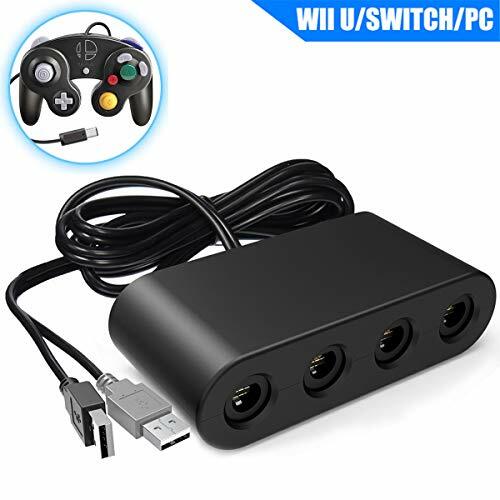 ✓The gamecube controller adapter is your best choice to play Super Smash Bros on nintendo switch, wii u. 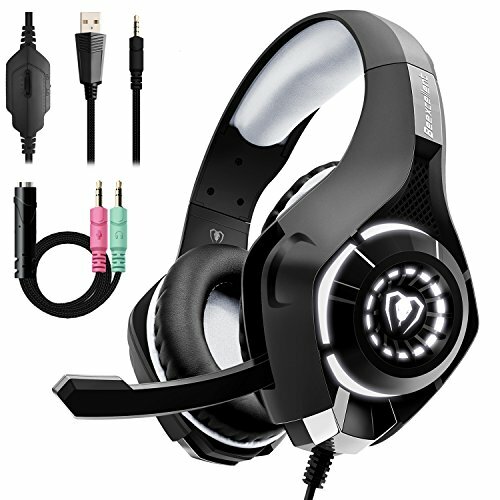 Very eays to use, just switch the button "Wii u/PC" located on the side and no driver need, no lay and interference with the built-in Vibration Feedback. ✓Support Nintendo Switch, Wii U, PC USB and Mac OS with the GC controller or wireless GC controllers. 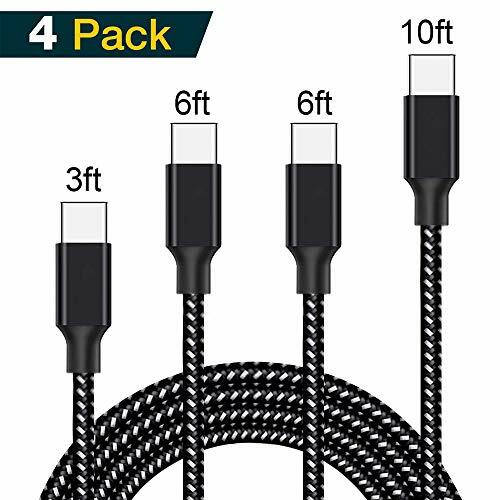 Allows you to connect up to eight gc controllers use at the same time(Need two adapters). ✓The Switch gamecube controller adapter can be used for Nintendo Switch. But the system need up to 4.0 version. There is no "+" "-" map buttons, so please note some game's function may not work. Surely the 5.0 verysion is absolutely ok.
✓Updated Version.The newest chip design. Japanese expert R&D. Beyond most gamecube controller adapter. So please just rest assure for the product quality. 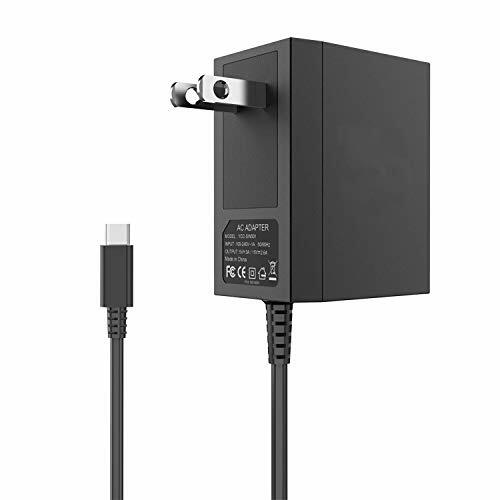 ✓Warranty Policy - 12 months warranty time, just rest assure to buy.If there is any concern or question about this Gamecube Adapter. Please feel free to contact us.